One issue that women often experience when going through menopause is that the symptoms are not limited to just the time of the day. Sleeplessness and fatigue can become important issues, if menopause side effects persist during the night. Taking too many pills is not a good idea, which is why some manufacturers have thought about offering women comfort during both day and night. 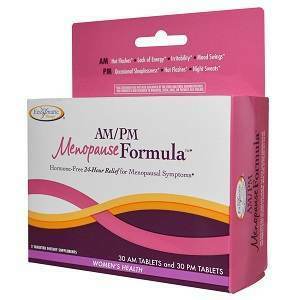 Such as product is AM/PM Menopause Formula Enzymatic Therapy. Let’s see what this supplement is all about and how it can help alleviate these problems. What Does AM/PM Menopause Formula Enzymatic Therapy Contain? It is great to have a formula that works for both day and night. From the list of ingredients, it looks like AM/PM Menopause Formula Enzymatic Therapy is quite a great supplement. The use of herbal remedies for treating menopause system is quite widespread and an alternative to hormone replacement therapy. The AM pill must be taken in the morning, and the PM pill about half an hour before going to bed. A package with 60 tablets costs 23.95USD and lasts for one month. For 60 days from your order you can return unopened bottles for a full refund. AM/PM Menopause Formula Enzymatic Therapy is a good, solid formula that addresses the problems experienced by women throughout day and night when they go through menopause. This is an important aspect, since symptoms can become so unpleasant, preventing women from sleeping well. Jackie Horowitz	reviewed Enzymatic Therapy	on May 17th	 and gave it a rating of 2.